Wai Yim is the artistic director of aetherplough, a performance art company in Omaha, NE. He recently directed and choreographed Spring Awakening, the musical at the University of Nebraska at Omaha. Other directing/ choreographing credit includes: genesis 2.0 (aetherplough), Best Little Whorehouse in Texas and A Funny Thing Happened on the way to the Forum (Chanticleer Theatre). 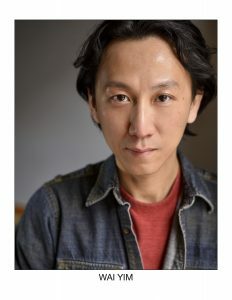 As a proud member of Actors’ Equity, his Chicago acting credit includes: Postnation, King of the Yees, The King of Hell’s Palace (Goodman Theatre), Chimerica (TimeLine Theatre). He has also worked with The Lookingglass Theatre Company and Victory Gardens Theater. Regional credit includes: The White Snake directed by Mary Zimmerman (Goodman Theatre, Old Globe Theatre, McCarter Theatre, WuZhen Theatre Festival in China), The Oldest Boy (Unicorn Theatre). In Omaha, he has worked with SNAP! Productions, Shelterbelt Theatre, Nebraska Shakespeare Festival, Nebraska Theatre Caravan, The Rose, Chanticleer Theatre, Omaha Playhouse, UNO Theatre and Blue Barn Theatre. His TV credit includes: Patriot (Amazon) and The Chi (Showtime).